Airbus produces the most modern and complete range of aircraft on the market, and has the best product support service. Its manufacturing operations throughout the world constitute a reference of quality and efficiency in the industry. One of the keys to helping Airbus become a leader in aviation is the pioneering spirit shared by its employees. The company contributes to shaping the future of air travel and drives sustainable growth around the world. Airbus is a truly global company, with 100% owned subsidiaries in the United States, China, Japan, India and the Middle East, and spare parts centres in Hamburg, Frankfurt, Washington, Beijing, Dubai and Singapore. It also has engineering and training centres in Toulouse, Miami, Mexico, Wichita, Hamburg, Bangalore, Beijing and Singapore, as well as an engineering centre in Russia. In addition, there are over 150 service centres around the world. 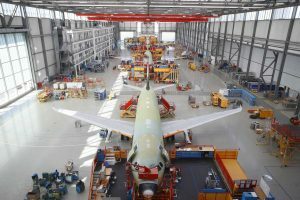 Airbus also relies on industrial cooperation and partnerships with large companies around the world, with a network of nearly 7,700 international suppliers. As an industry leader, Airbus strives to be a truly eco-efficient company, and is the first aeronautical company in the world to obtain the ISO 14001 environmental certification for all its production centres and the complete life cycle of its products. Airbus intends air transport to continue being an eco-efficient form of transport that generates economic value while minimising its environmental impact. FISAIR has collaborated with Airbus on supplying large HEF5 evaporative cooling units for different European plants. These units cool large industrial vessels using mains water as a cooling medium, thus reducing the energy consumed in aircraft assembly plants enormously and contributing to the employees and airplanes enjoying exceptional temperature and humidity conditions.